Among hotel loyalty programs there is something that draws customers back to the hotel. For avid mile and points chasers the tactics may be ways to stretch their hotel points, earn easy status, or get ultra luxury benefits during stays. Given that hotel programs are competing for your business, each tries to lure customers back with unique or valuable perks. 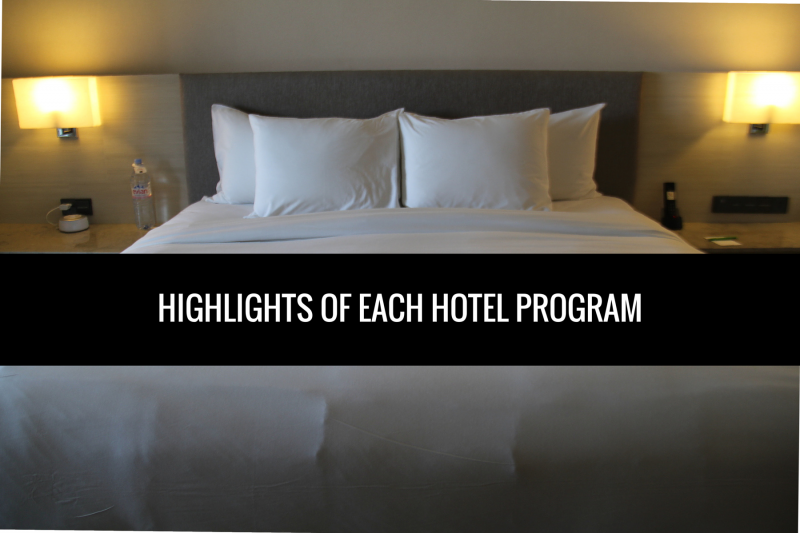 Here is a review of what I think are the top benefits from each major hotel rewards program. I’ve decided to broaden the perks to include easy ways to gain elite status (via credit cards or promotions) as well as certain perks of upper elite status levels. Basically anything that sets the program apart. Points + Cash nights – great value and are valid on eligible nights for earning status, promotions, and earning points. Four confirmed Diamond Suite Upgrade Awards as Diamond elite status member. High value redemptions – it is possible to redeem points at 2.0+ cents per point. Choice of complimentary welcome gift – 1,000 bonus points or welcome amenity. Get the 5th night free benefit on award stays of 5 consecutive nights or more. 2-for-1 award nights with the Club Carlson Visa. Automatic Gold elite status with the Club Carlson Visa. Among lowest spend at hotels to earn free night with elite status and Club Carlson Visa. 2-for-1 & 4-for-2 paid stays in Europe, Middle East, and Africa. Cash & Points nights – can be a great value. 10 confirmed suite upgrades as Platinum elite status member. Complimentary room upgrades to suites if available. In case the room has lowest price available then you can book it with points even if free nights are not available online. Choice of complimentary welcome gift – bonus points, free wifi, or drink. PointBreaks promotions – list of hotels offering discounted award nights of 5,000 points per night. Best Rate Guarantee – one free night. Free night at any IHG hotel from the IHG credit card. Automatic Platinum elite status with the IHG credit card. Lots of properties in many regions. Free executive lounge access with Gold elite status. 5th night free benefit on award stays of 5 consecutive nights or more. Automatic Gold elite status with Marriott credit card. $100 hotel credits for paid stays two nights or longer with Gold elite status. Depending on what benefits you value from each program a particular one may suite your travel needs better. Foremost the program has to have hotel properties at the locations you travel to frequently, apart from that I’d evaluate the additional perks of having status. The standout perks to me across all hotel loyalty programs are Club Carlson’s 2-for-1 award nights that come with the Club Carlson Visa. Plus the card gets you automatic Gold status. Hyatt also offers a huge value as a whole with its Points + Cash nights and great Diamond benefits. Too bad they are not handing out Diamond status anymore. If you frequently book longer stays getting a 5th night free with Marriott and Hilton can help you stretch your points. What is your take? What hotel program perks do you find most valuable? Great post! Having accumulated a fair share of points and miles across programmes, we’re now trying to figure out how to best redeem them, and this post is very useful. As is the rest of your blog! Thanks and glad you found it helpful, let me know if you have any other questions about miles and points!